Twenty-two Realty of Maine agents attended the 2014 Maine Association of REALTORS® annual convention at the Samoset resort in Rockland this week. Our own Denise Reed was presented the REALTOR® of the Year award for the Greater Bangor Association of REALTORS®. 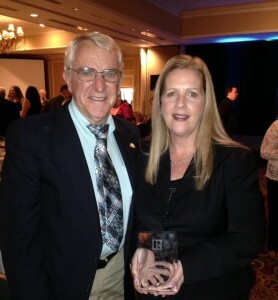 Ed Gardner of the Portland Board of REALTORS® was presented the Maine REALTOR® of the Year award. National Association of REALTORS® 2014 Presdent Steve Brown told the group that a tight credit market still hinders a strong real estate recovery. NAR continues to lead the fight in Washington to protect the American homeowner's mortgage interest tax deduction on first and second homes and pushes for responsible lending standards. Hug a REALTOR® today!